Art history comes to life when Meet the Masters students study Frederic Remington. Students explore his realistic paintings which recorded details of the American “Old West.” His beautiful landscapes and action-packed scenes help students relive this significant time in American history. Meet the Masters students view PowerPoint slides showing Remington’s paintings while hearing stories of his life and exciting adventures. To experience life in the cavalry of the Old West, Remington camped with the soldiers and spent his days with them on horseback. His paintings realistically capture his personal experiences. He spent evenings sitting by the campfire listening to cowboys tell exciting tales of their adventures and experiences. Later he turned their words into sketches. Students examine several of Remington’s paintings for the details and the dramatic moments he depicts. They examine a painting with Indians bracing for battle and notice a lone brave on his horse galloping to escape, his horse’s flesh shiny with sweat. Paintings like these made Remington a popular and important illustrator, showing students how an artist becomes a historian. Now it is time to practice the techniques Remington used to make his paintings come to life. Student packets include mostly self-guided worksheets where they can prepare by drawing landscapes that capture the hills and mountains of the western scenery. 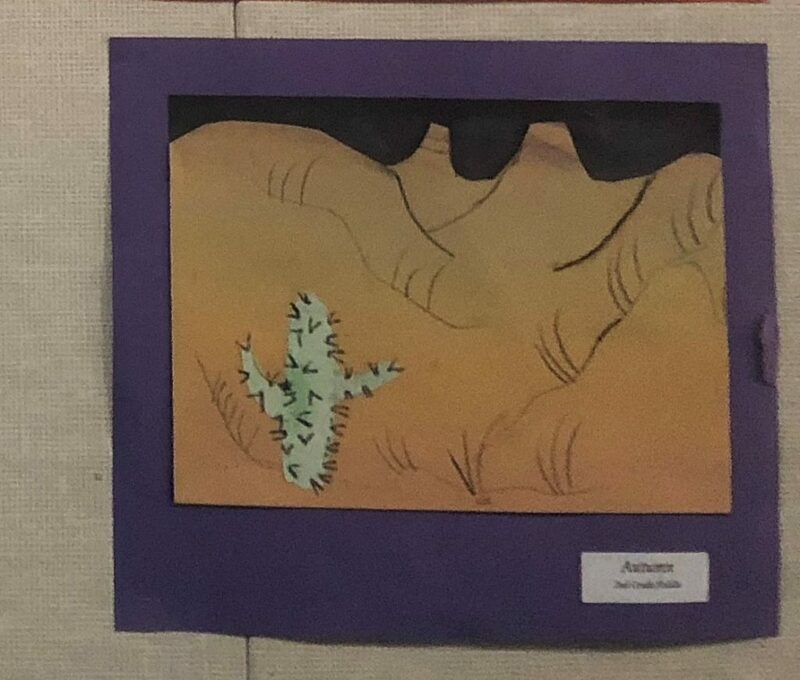 Students practice details like cactus with short, sharp thorns. Using “perspective” techniques, they practice drawing foreground cactus larger and with more detail than the smaller background cactus. 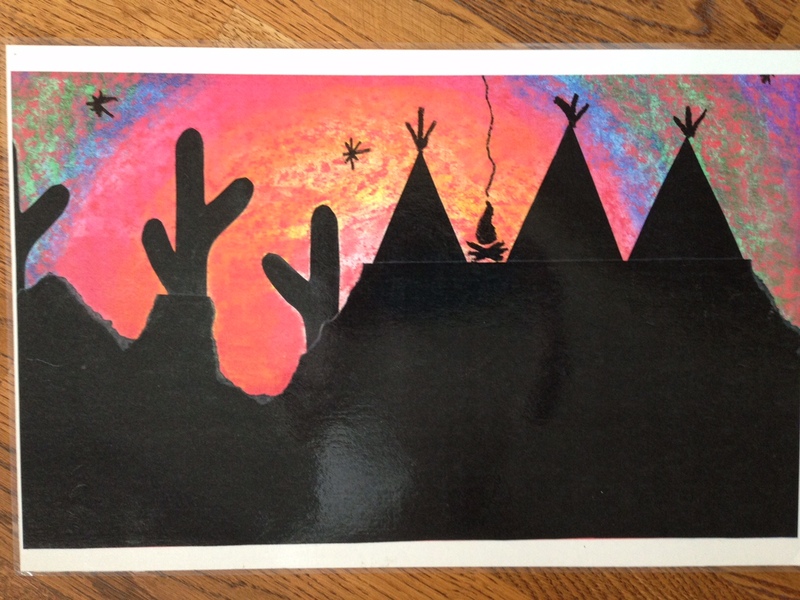 Now students are ready to create their own Old West landscape. After being inspired by the techniques and experiences of the master, students are ready to create their own art project. There are multiple levels to match up to the student ages: kindergarten, beginner (grades 1 & 2), intermediate (grades 3 & 4) and advanced (grades 5+). Students receive colored chalk, along with black and light brown construction paper. Starting with the background, they draw flat-topped plateaus, then add special “shadow” mountains using a unique technique and two warm colors of chalk. They use the colored chalk to reflect the beautiful colors in the desert hills, then use a tissue to carefully blend the warm colors. Using a black pencil, students add just a few partial hills and details, being careful not to add too many details to the quiet and “uncluttered” desert. 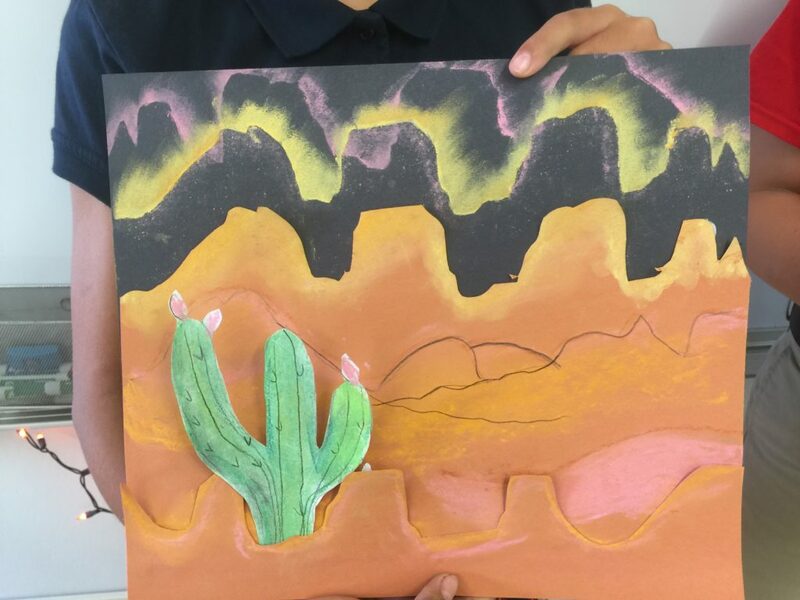 For the final touch, students color and glue a cactus to their landscape, adding thorns and veins to make it look very realistic and become a part of the landscape. Inspired by the American artist, Frederic Remington, Meet the Masters students created their own realistic Old West landscape in a unique way. They learned about perspective, background and foreground, details and realism. They learned how Remington had recorded the details of a time and place that would soon no longer exist, the days of the Old West. 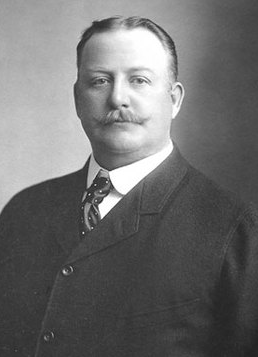 Learn more about our Frederic Remington art project.